Chicken Vol Au Vents Recipe | Simple. Tasty. Good. Chicken vol au vents, another comfy dish that appears quite frequently on our table here. A bit old-fashioned maybe but nevertheless extremely tasty! I made my puff pastry vol au vents myself for this recipe (they are very easy to make!) but you can sometimes find them ready-made in a deli or bigger supermarket here in Europe. 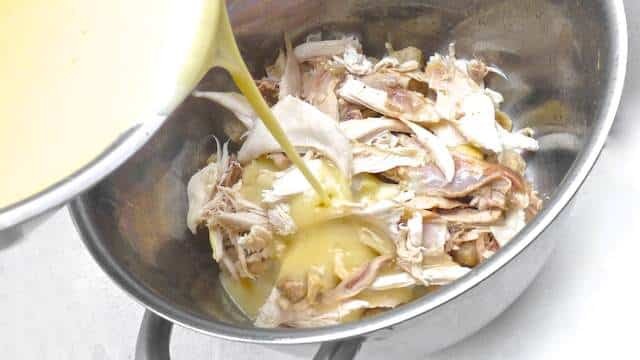 I use the freshly made chicken stock to make the white sauce: this makes it very flavorful. You can use milk (or replace half of the stock by milk or cream) if you prefer. Whatever you do: don’t throw that rich chicken stock away! Serve the chicken vol au vents with fries and a fresh green salad. Here am I, preparing my chicken vol au vent for a live cooking show named Savour the Flavour! 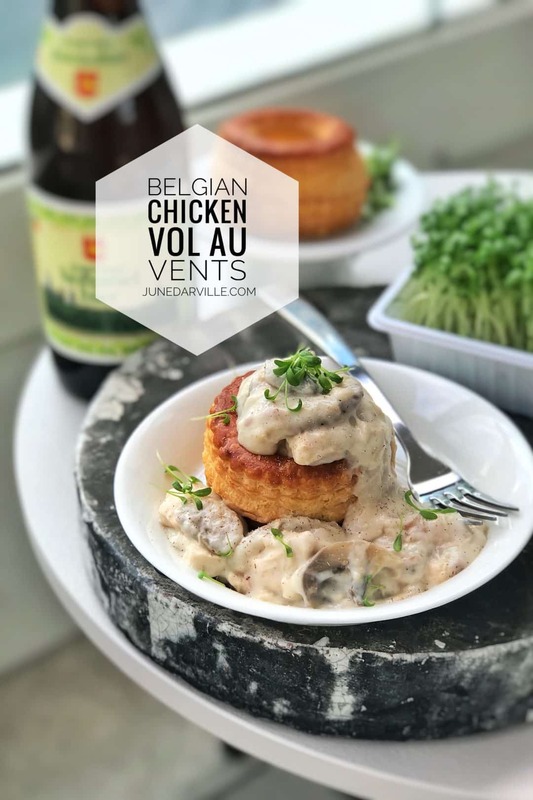 Belgian chicken vol au vents: chicken with meatballs and mushroom in white sauce! 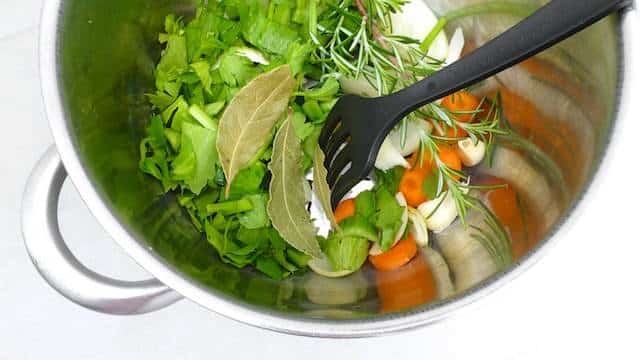 Add the rosemary, garlic, bay leaves, cloves, chopped celery, carrot and onion to a high pan. Season generously with pepper and salt. Cut the chicken up: legs, wings and breasts. Also chop up the remaining carcass. Add it all to the pan. Then fill it with water (I added about 7 cups or 1,7 l) until the chicken is fully submerged. Place the pan over high heat until boiling, then leave it there for 10 minutes. Then turn the heat lower and gently cook the chicken for about 30 minutes. After that take the chicken off the heat and let it cool down for another 45 minutes. 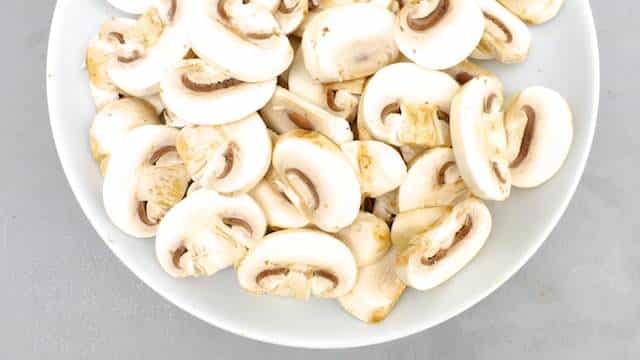 In the meantime chop the mushrooms into bite-size pieces. Transfer the pork and veal mince to a bowl and season with pepper and salt. Knead the mince well and make tiny balls of ½ oz (15 g) each. You should end up with about 20 of them. 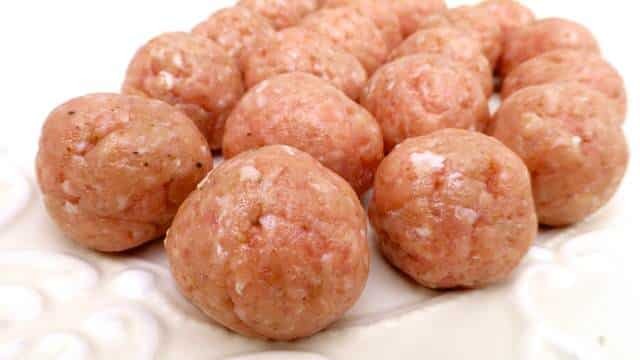 Cover the meatballs with cling film and store them in the fridge until later. Then remove the cooled cooked chicken from the hot stock (don't throw the stock away, we'll make our white sauce with it later). 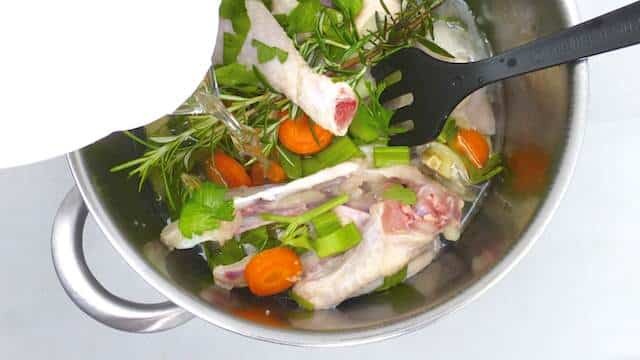 Remove any chicken skin, bones, veins, cartilage or sinew (discard all this) and pick the cooked meat from the bones. Shred the larger bits up roughly. Then transfer the chicken meat to a large pan. 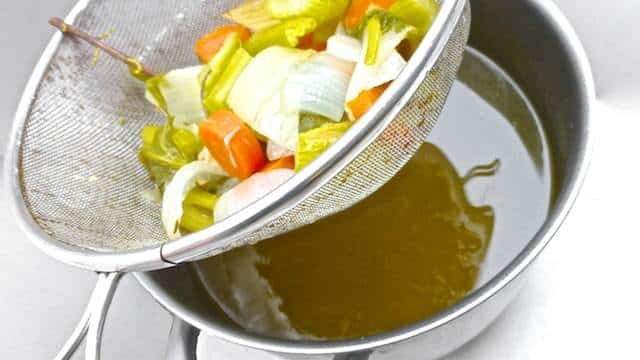 Strain the chicken stock in a fine sieve or colander over a large pan. I ended up with 6 cups (1,4 l) of flavorful chicken stock. Discard the cooked vegetables. Then bring the stock to a gentle boil again. Once warm, add the meatballs and mushrooms. Poach them for about 5 minutes. 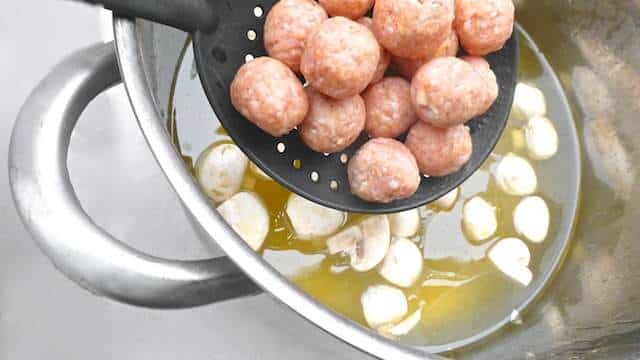 Then remove the meatballs and mushrooms using a slotted spoon. 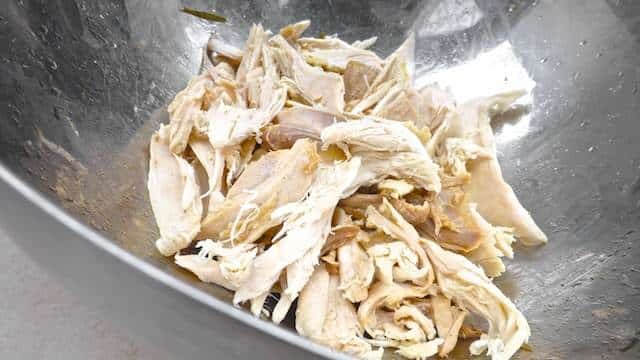 Add them to the shredded chicken. Take the chicken stock off the heat now. 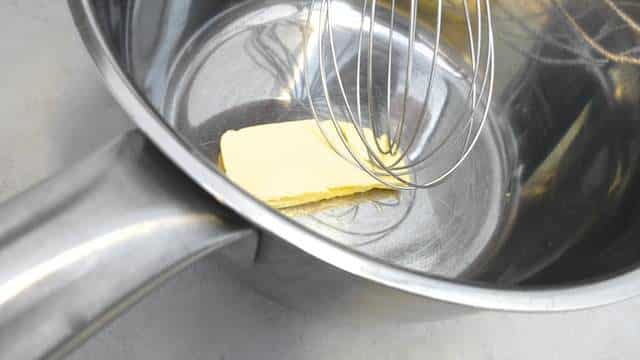 In a large saucepan melt the butter over medium heat. 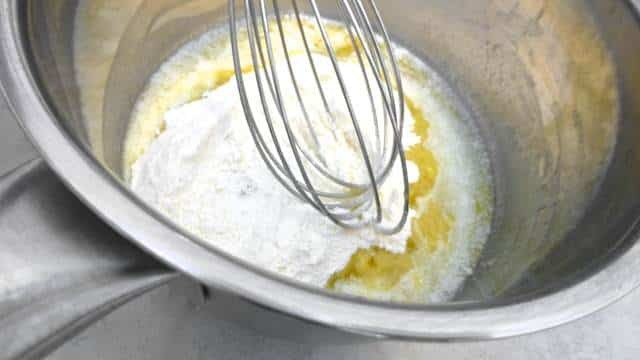 Add the flour and whisk well until you get a wet crumble. Gently bake this over medium-low heat for about a minute. Then gradually add splashes of the warm chicken stock until you get a sticky flour paste. Keep stirring. Don't add too much at once or the sauce will become lumpy. Whisk well. Gradually add more chicken stock (about 3 to 4 cups) until you get a pretty runny white sauce. 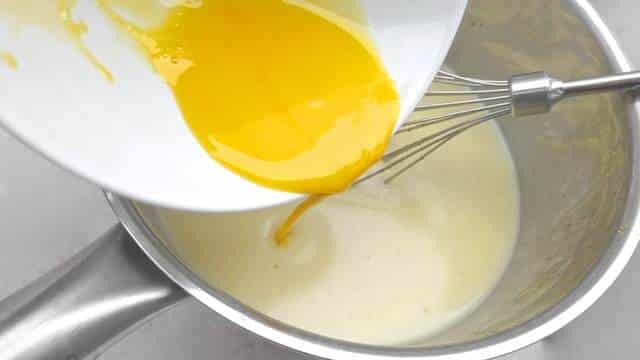 In the end, remove the white sauce from the heat and add the beaten egg yolk. Stir quickly so the yolk doesn't scramble. 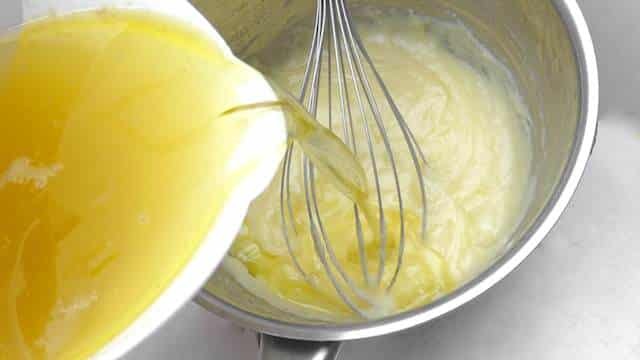 The sauce will thicken a little extra (this egg yolk technique is called a 'liaison' in French). Check the seasoning and add extra pepper or salt to taste. 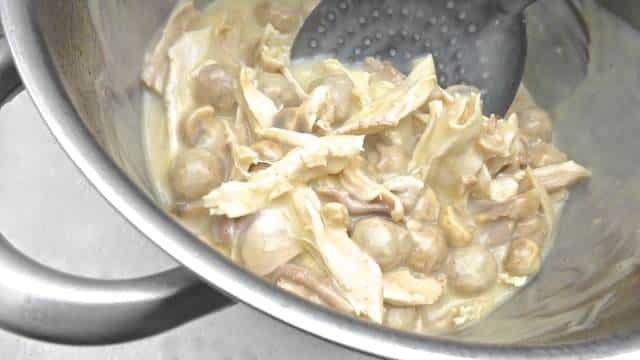 Then add the white sauce to the chicken, meatballs and mushrooms. Stir carefully. Cover the pan for another 5 minutes and let the vol au vent warm through or place it back over very low heat. Put the vol au vent puff pastry casings onto plates. 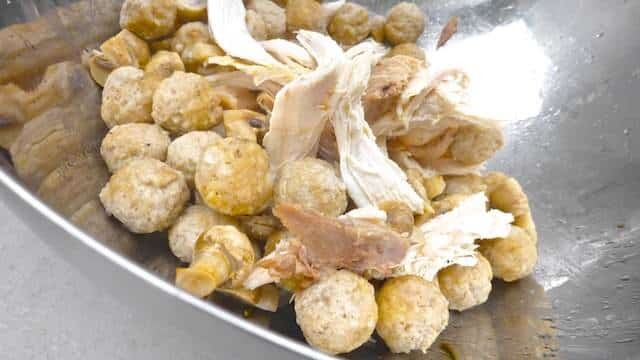 Top with the chicken, meatballs and mushrooms. Serve the chicken vol au vents hot.